Looking for another simple, delicious way to use up your fresh garden produce? Me too! In a large bowl, mix the first 9 ingredients — let stand at room temperature for about 45 minutes. 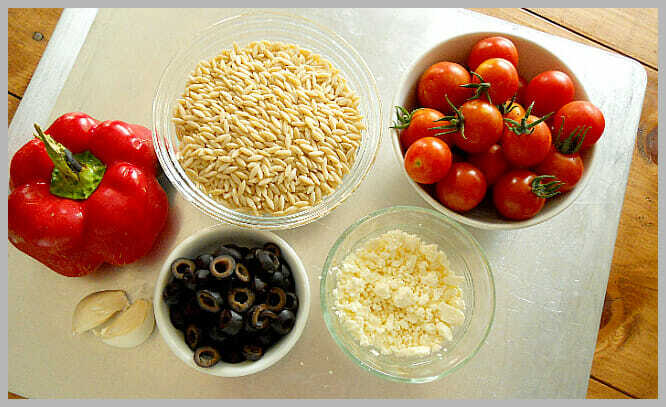 Add orzo and cook for 8 to 10 minutes; drain and toss with the vegetable mixture. What are you doing with your extra vegetables? Hi Andrea. Do you think this would be good as a cold salad – like at a cookout/potluck? I’m looking for a cold pasta/ macaraoni salad & this caught my eye. Thanks. hmmm… I’m not sure. I wonder if it would get a little too “sticky” when it’s cold? I don’t know. Maybe try a really small batch first? I will definitely try this tomorrow night dice I already have my spaghetti sauce in the crock pot 🙂 Just to clarify, though. You said orzo is a good alternative to pasta. But orzo is pasta. So look for it in the pasta aisle. Looking forward to adding this to the menu plan! 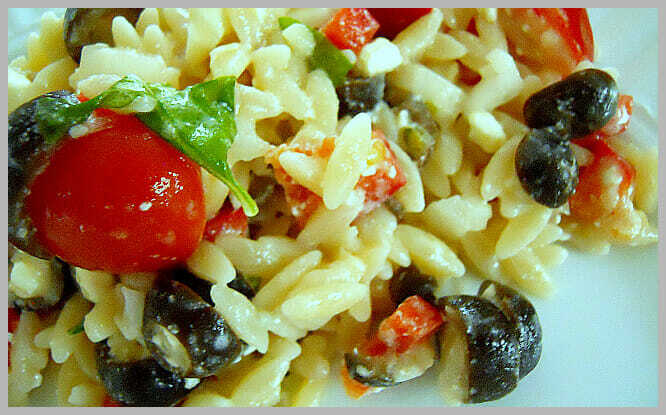 I have never used orzo! This looks so pretty and delicious! I usually make stir fry when I have a ton of veggies or I just cut them small and stick them into just about anything. The rest of the family doesn’t usually notice! Debbi, I never tried it until 2 years ago either. And now we’re hooked!